I have written about this wine twice, both times it sucked. 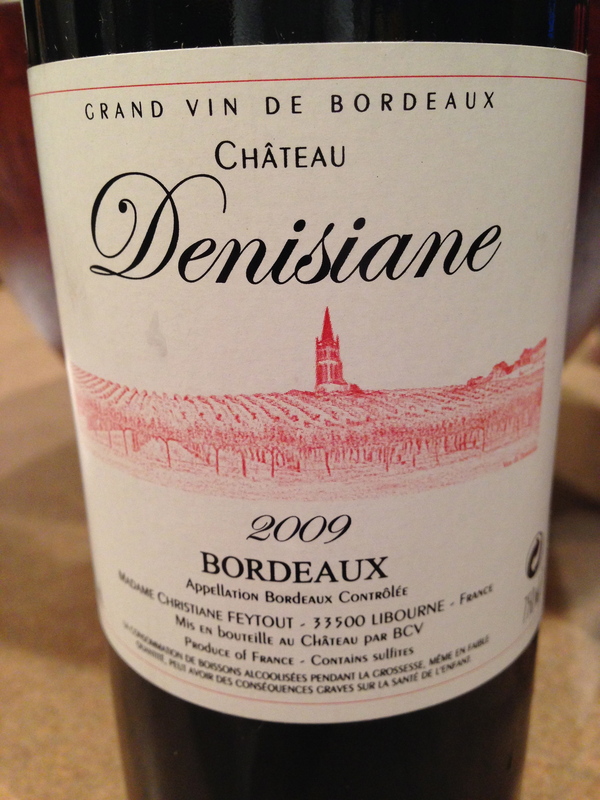 The 2009 Denisiane completely underwhelmed me and pissed me off because I had bought a case on high recommendations. I have given it some time to sort itself out (actually I was ignoring it). Tonight, it came through, sorta. After last night’s epic dinner of Ribeyes etc, we had some leftover meat and mushrooms. I wanted to spice things up so I concocted a spicy Panang curry comprising the leftovers, peas, onions and sliced almonds. The curry was medium hot on the spice scale and the ingredients melded beautifully. I had no aspirations of pairing this wine well when I came across it in the cellar. Almost a ‘throwaway’ I figured it couldn’t hurt and besides- I was not about to open something good for the curry. Regulation purple color in the glass it actually offered up plums and dark currants in the nose. Prior to eating the curry, I tasted it and was not overly impressed. Once I got stuck in, the wine surprised me. The fruit actually sharpened, the tannins cut the heat and the acidity was beautiful. I could not have paired a better red with this South East Asian dish! After dinner I let my taste buds normalize so I could further evaluate the wine. It was starting to come alive. More dark plums and blackberry came across. The tannins were quite dry and persistent. The acidity was back to normal, which was good. I panned this wine big time. For $12 I thought it was crap and had no chance of improving. I was wrong. It has evolved and come out of its shell. Still a very basic red table wine I think should now garner 85 points. However, seeing as I had to work on it for over 2 years it only deserves 2 stars from me. I would never buy it again, but actually look forward to the future evolution of what I still have in cellar. Salut…. PS. I got most of the way through dinner when I realized that peas are not Paleo diet friendly. Sorry Moxie, I cheated…..but not on purpose.